Ok, I've never been a huge fan of this actor, and i don't really like the batman series of movies. That was until i saw 'the machinist' People who've seen this movie, will know what i'm talking about. ok, so a few days back i put on 'the movie channel' and the movie had already started, i didn't know which movie was playing but it had just started, it looked interesting, so i began to watch, it was about an insomniac, who was losing weight continuously and something was just not right in his head. i didn't recognize the actor at first, but he looked awfully familiar. By the end of the movie, i realized it was christian bale. i was shocked, in the movie, he is so thin, he looks aneroxic, far cry from the buff batman he played in batman begins. Forget renee zellweger putting on the pounds for bridget jones, this is the real deal, he lost 63 pounds by starving himself and he's almost unrecognizable, now that's an actor!!! i really respect him now. i'm uploading a picture from the movie, you won't believe this. This was an incredible movie, and one of his best, i think. I read in an article that he got addicted to the whole weight loss thing once he got started and his wife had to beg him to stop because he was killing himself. He is an incredible actor! That's for sure! Yeah, he definitely is an incredible actor, I really didn't think much of him before, I'd seen batman and it wasn't really, well, my cup o' tea. But after this movie, I see him in a whole new light, just knowing that he's so dedicated to his roles, just gives me a new perspective on the roles he plays and how well he plays them. I recently saw, the prestige, and I loved his work in it too. What's so amazing is that he looks sooooo different in each of his movies, you can barely recognize him. He did a movie when he was really young called "All the Little Animals" in which he played a mentally challenged teenager whose stepfather was trying to take advantage of his family's business after his mother passed away. It turned out to be a pretty amazing movie, but it's hard to come buy on the cable channels. Sundance or IFC might run it at some point, but it's a pretty deep film and another character he naild spot on. When i first saw him in American Psycho i saw him as quite humourous and i guess the role wasn't his type of character even though he did it quite well. I didn't like him in batman begins. but I thought he was quite good in Equilibrium. The machinist was definitely his best film and I thought he should've won more recognised awards for it. He looked nothing like himself in that role, in fact, he looked more like Ethan Hawke, if not exactly. I'm bringing this topic back to life, because this is one of my favourite, if not my favourite movies of all time. Btw, Christian Bale did this movie role right before he did Batman. He fasted/dieted for 3 months. In fact, after he started putting on the pounds again, he even got more bulked up as you will notice in his batman role. But the reason i loved this movie so much was due to the wow factor at the end of it. I had actually rented this movie out expecting it to be interesting because im a big fan of psychological thrillers and had even read part of the spoilers before. But the way the film brings together all the clues it displayed into the end was far beyond amazing. The whole plot was original and it was a truely surprise ending because - i had already knew that the other guy was just his imagination. but when they connected all the pieces together with the accident, it explained everything like how come he was anorexic and why he hadn't slept for a year. Everyone should take out this movie when they get a chance and watch it! yeah, the ending was very surprising and very real too. A man trapped in his own head, and we unravel the mystery of it right along with him, I loved how all the characters had gotten distorted in his head and become new characters in his life, pure genius, it is a must-see. Oh, and thanks for breathing new life into this one, I put this comment on somebody else's response by mistake, my bad!! I guess he is dedicated, to risk his health for a movie role like that. I will have to check out the movie since I am not a fan of his either. I was disappointed in Batman Returns and most of that was due to the actor playing the role. Though it won't stop me from checking out the Dark Knight due to be released in 2008. That he is talented enough to change for his roles though was evident to me, when I realized that he was in Reign of Fire and I didn't know it was the same actor, as the one who is the "new" batman. I am one of those annoying people who can watch a movie and notice or recognize an abscure actor from an old movie or tv show and put it together. In fact yesterday we were watching something from the late 80's on tv, and there was an old man in the show, I asked the others if they knew what show he was from. LOL it was the actor that played Larry Tate on the old Betwitched TV series, so he was about 22 years older in the program I watched yesterday then he was in that series and I hadn't seen an episode of that show not even on tv lad since I was a kid. Drat now I am going to have to go and look up the Christian Bale movies on www.imdb.com and see how many of them I can see. I really admire when an actor is talented enough that you don't know them from one movie to the next. Even if some of the characters they portray are not ones I like. hey i'm also one of those annoying people who recognizes faces and actors who've been in other movies no one's heard about. it's great when an actor completely changes the way they look and the way they actually are. oh, and thanks for breathing new life into this one. Bale is an amazing actor and I remember seeing him first in I think it was American Psycho, which was cool. I think he was really cool in The Prestige too, and Batman Begins was a damn sight better than the 1989 Batman (although it was cool at the time and Jack was an awesome Joker). 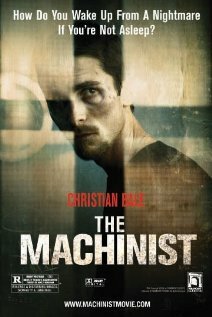 I have not got round to seeing The Machinist as yet, although a lot of my friends have raved avout it, so I'll try and grab a copy soon. Yeah, trust me, the machinist is one of his best works, you'll definitely enjoy it. I am a big fan of Christian Bale-he is possibly every film maker's dream. The dedication and the passion of this actor makes it effortless for him to contribute most to a movie's success. Way to go, dark knight. 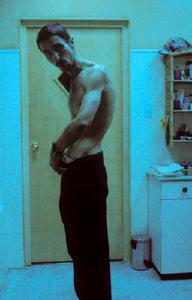 The Machinist... I believe that he is truly gifted. After watching the film, I thought that he is someone who loves what he's doing. I saw him from a tv show, saying that he would never really feel like the character if he wouldn't be the character--an insomniac--that's why he tried to lose weight (I believe he was only 120 lbs). My sources say he only ate a can of tuna and bubble gum. But he gained the weight back for Batman Begins. Yeah, it's cool, seeing him as Reznik, the skinny troubled Reznik and then as the complete opposite, a superhero, although I'm not a big fan of Batman begins, but I love this guy..
i have seen this movie with my family years ago even before batman begins was released in cinemas ( by the way, i love christina bale's batman begins. he's the greatest batman ever!). i thought that the machinist was boring at first. but later on, the movie seems to get interesting bit by bit. and to tell you honestly, the story is great! christian bale did a lot of hard work in this film. their are lots of wonderful films christian bale has starred in. i forgot of the titles but reign of fire is also very great! yup, it's one of those movies that unwrap like the petals of a rose, they open up one by one and just reveal the mystery in a very seductive way. That's how I can best describe the movie. I've been a fan of his for a long time. He's very versatile and some of his best movies aren't the most popular ones, so you have to go hunting for them. The Machinist is very disturbing, but if all that it had going for it was his weight loss, it wouldn't have been that good. One of his first movies was when he was still just a kid--Empire of the Sun. Excellent war movie. well, it's not just because he lost all that weight, although that is applaudable, but after watching the movie i also recognized his great acting abilities. And yeah, the movie was one of those disturbing ones, but entertaining all the way. I haven't seen a lot of his movies, that's why i was kinda struck so much by it. Empire of the sun.... i'll make sure to keep an eye out for this one. this movie was deffanitly a good one. I also have a huge respect for him as an actor. If you looks at all the roles he's played....it proves he has a passion for what he does. Im not really into the batman movies either. My favorite movies he has been in is this one, the prestiege, and ameican psycho. I havent gotten a chance to see 3:10 to yuma but i think it looks pretty good. SO ill deff have to check it out once i get the time.